Some of my most joyful moments in the kitchen involve making buttercream frosting. The fluffier, the better – that’s my motto. It’s not only fun for me to make and eat myself, but I also immensely enjoy the reactions from those I love when that first swipe of fluffiness reaches their lips. Really great buttercreams are not an everyday occurrence. They’re special, and should be totally and completely enjoyed without guilt. That’s another motto of mine. 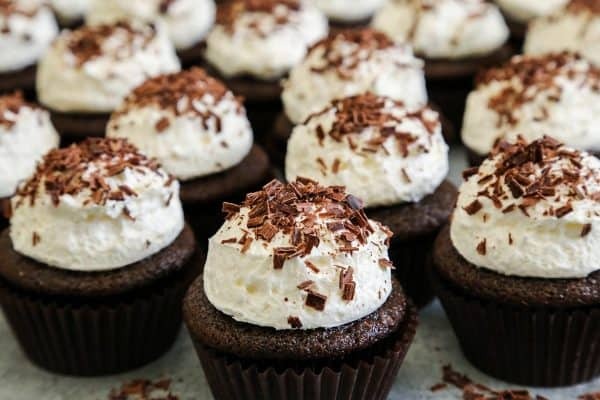 These Chocolate Cupcakes with Fluffy Marshmallow Buttercream have swept us off our feet. They are indulgent in the most celebratory kind of way. 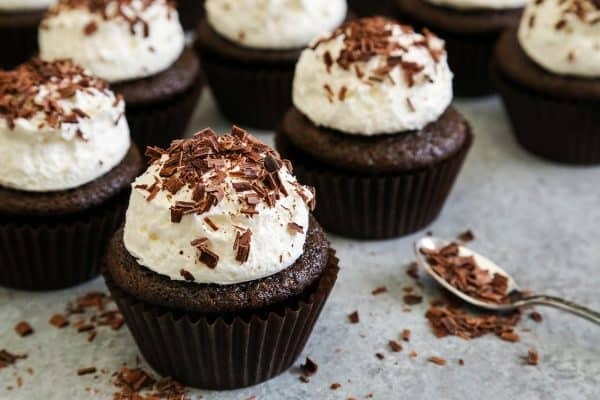 If you’ve been looking for a special cupcake that’s easy to make, look no further! Start with room temperature butter by taking it out of the refrigerator in plenty of time to completely soften on its own. Do NOT soften your butter in the microwave, as this tends to soften it unevenly. Whip the butter. Alot! I start out by whipping the butter alone…for a full 8 minutes in my stand mixer with the paddle attachment. You might think that sounds crazy to whip the butter for that long, but just trust me. A longer whipping time allows more air to be incorporated, and you will see the butter lighten in both color and texture. Beat in the powdered sugar, a bit of salt, some half and half or heavy cream, and any flavorings. To add color to your buttercream, I recommend gel colors. Gels have less liquid and more pigment than liquid colorings, which means you can use less and won’t risk diluting the frosting with excess liquid. I’m a total fan of gel colors. Now whip it all again! For this final step, I set the timer for 5 minutes and walk away, only returning once or twice during this time to scrape down the bowl. 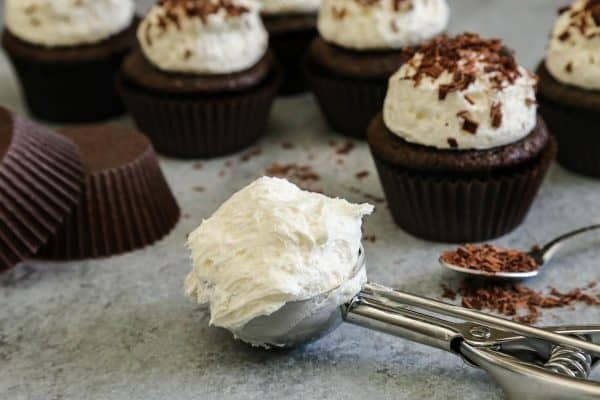 Have you ever used a scoop to add frosting to cupcakes? It’s one of my favorite methods! You will want to seek out a large scoop that has a big diameter. I like this 4-tablespoon scoop that allows a small perimeter of cake to remain visible in this standard sized cupcake. The scoop method for applying the fluffy marshmallow buttercream pronounces the fluffiness of this frosting. It enables the frosting to sit nice and tall, with very little effort. It’s so easy! To finish these off, I simply sprinkled the frosted tops with shavings from a chocolate bar. 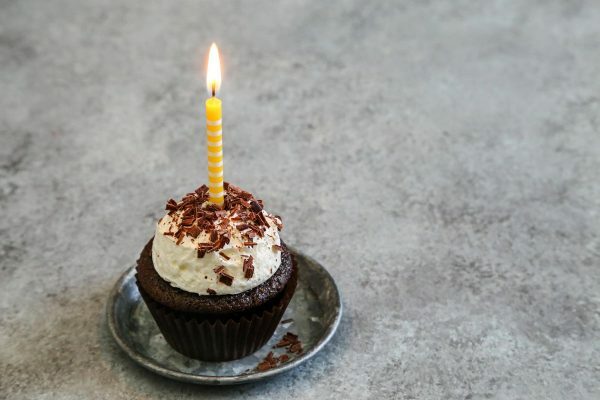 I know that so many people feel intimidated to make their own cupcakes for celebrations, afraid they won’t be able to produce treats that look and feel special enough. But I beg you to let go of those belittling feelings and just give this recipe a try. You’ll be surprised at the results of this easy-to-make chocolate cupcake recipe, and even find a little joy in the process. This cupcake has won over children and adults alike. 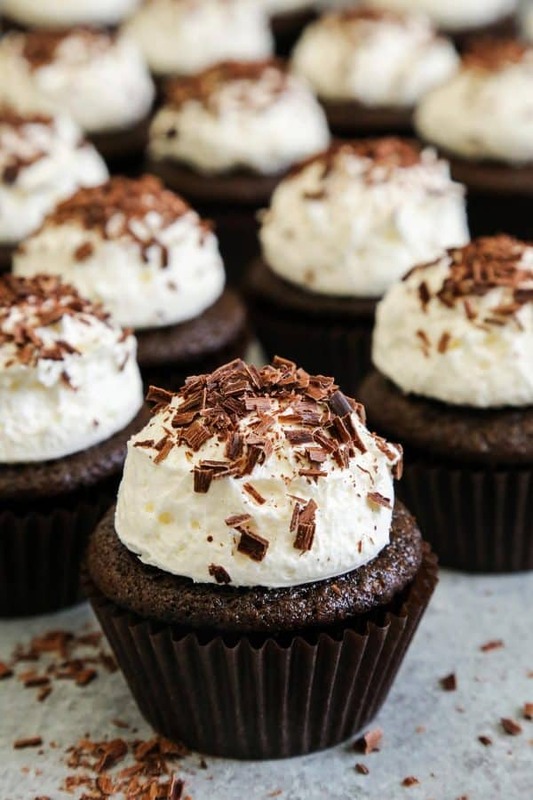 A moist and delicious chocolate cupcake is adorned with a big scoop of the fluffiest marshmallow buttercream. So fun! Preheat oven to 350°F. Line 2 regular size cupcake pans with 24 paper liners and set aside. In a large bowl, whisk all dry ingredients to combine. Make 3 large holes in the dry ingredients. In a separate smaller bowl, combine oil and vinegar. Pour this into the 3 holes. Pour the water over entire mixture. Mix with a fork. Add vanilla and stir. Divide evenly into the 24 cupcake wells. Bake for about 25 minutes, or just until a toothpick comes out clean. Remove cupcakes to wire rack to cool completely. In the bowl of a stand mixer fitted with a paddle attachment, whip butter on medium-high speed until very fluffy, about 8 minutes, occasionally scraping down the sides and bottom of the bowl. Add powdered sugar and salt, and beat on low to incorporate. Add half and half and vanilla extract, mixing on low until combined. Increase mixer speed to medium-high and beat until very light and fluffy, about 5 minutes, occasionally scraping down the sides and bottom of the bowl. Then add marshmallow creme and mix on medium speed until just combined. Use a large 4-tablespoon scoop to top each cupcake with a round of marshmallow buttercream. Gently tap the bottom of the cupcake on the counter once or twice to settle the buttercream onto the cupcake. The marshmallow buttercream recipe makes enough frosting for 24 cupcakes frosted in this generous manner. 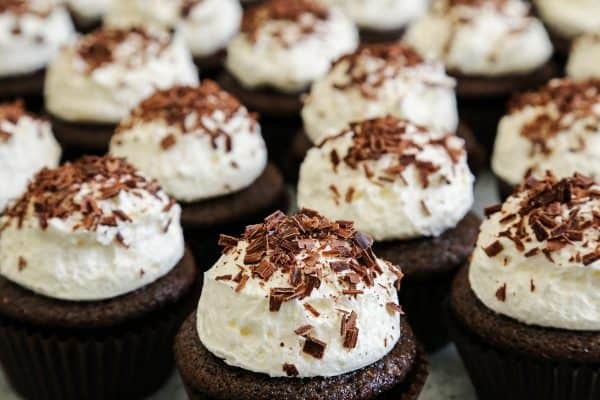 Top the marshmallow buttercream with a sprinkling of chocolate shavings. 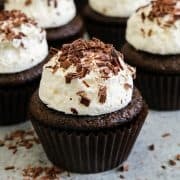 0 Response to "CHOCOLATE CUPCAKES WITH FLUFFY MARSHMALLOW BUTTERCREAM"